When I asked Riga Jewish Museum curator Lia German if she had a message for other Jews, she said, "I have no message. If they want to know about us [Latvian Jews] they can come here." As she stated, I was in the Latvian capital to know about a part of my heritage. Lia's message hangs on the walls of the museum in the form of a small but moving tribute to the victims of the war which she helped collect and translate. Downstairs in the foyer, Lazers Bindeman, a former Russian soldier, considered some photographs. He was in his native city to visit his family, though not a reunion filled with merriment. His mother and three brothers are in the cemetery. They were killed by Germans in World War II. "The conditions during the war were very bad," he explained, "I don't know how anyone survived." Considering the barbarous events of the war, it is indeed a wonder. Lazers, 74, was back in Riga for only the second time since emigrating to Brooklyn, New York in 1978. A former shoe factory manager here, he took his lawyer wife and five other members of his family, leaving behind a Soviet controlled Latvia. He didn't speak a word of English then but somehow managed to land an engineering job with the Omni Hotel. "It was my first and only job in America," he boasted. "But it wasn't an easy time." History tells us that times have never been easy for the Jews of Riga, though with the advent of perestroika, today's community of 15,000 (only half of which are native Latvians) has it easier than perhaps any time preceding it. Lia and Lazers have experienced the best and worst of those times. Though their experiences are different, they share a bitterness. Even on Latvia's regained independence, Lia commented spiritlessly: "It wasn't bad. I was born in an independent Latvia. [Independence] was quite natural. I always had Latvian friends, so my feelings didn't change [after independence]." By contrast, Lazers was a bit more spry, remarking, "It's wonderful to be here in a free Latvia again." In the early part of this century, Jews were charged for provoking riots by the enemies of the revolutions of 1905 against Tsar Nicholas II, and again during the Bolshevik Revolution of 1917. Supporters, on the otherhand, blamed Jews for the failures. After the Germans invaded Riga, the balance of political power was destabalised and again Jews were reproached. The peace which followed would be short lived, as the rise of Hitler loomed forebodingly on the political horizon. When the Red Army entered Riga in June 1940, many Jews scrambled to the USSR, for faith in the West was lost. During this period, leading Jewish leaders were arrested and deported to a Siberia from which they would never return. Lia German and her family were some of the lucky ones. When war broke out in June 1941, they went to Semipalatinsk, Kazakstan. "It was a long, uncomfortable journey. But we lived okay there," she told me. "My mother worked for the Latvian ministry, so she came back to Riga about a year before me. And then one day (in 1944) she just telephoned me and said, ŒLia, come back to Riga.'" At 19, she entered the Institute to study philology, a perfectly suitable topic for a girl who grew up surrounded by German, Yiddish, Latvian, Russian, and Hebrew. 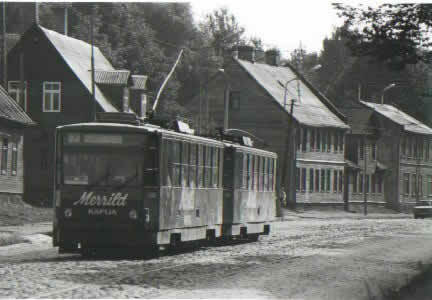 After the defeat of Hitler, thousands of Jews returned to Latvia, including Jews from other parts of the Soviet empire. 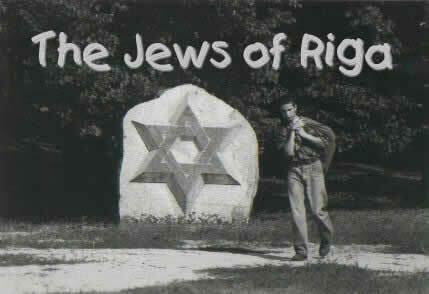 By 1989, some 23,000 Jews were registered in Riga, a number which continuously diminishes due to emigration to Israel, Britain, and the United States. Still, Jewish doctors, scientists, engineers, artists, and teachers are making a noticeable impression on the culture of the city. Today's Jews live freely and with the full support of the Latvian government. Rabbi Mordechai Glazman came to Riga in March 1992 with his family to make good on the biblical command, "Ahavat Yisroel - Love of a fellow Jew," to which Chabad, an international movement to raise the Jewish consciousness of world Jewry, adheres. We met after a Tuesday morning service at the synagogue in the heart of the Old City. "In the beginning, it was really tough for my wife and me," he confided over some latkas and salad in the soup kitchen he oversees adjacent to the synagogue. "I couldn't speak Russian (which most older members of the community speak), so getting anything done was difficult. Our apartment was awful, too. And the shops didn't have the basic essentials; just finding toilet paper was an ordeal. But things have improved immensely in the last few years, for everyone here, not only Jews." Since his arrival, he told me the biggest change has been "the general interest of the community in their Judaism. The community as a whole has been reinvented." The changes in the Jewish community have indeed been striking, most notably since 1992. The Ohel Menachem Kindergarten and Day School opened in September 1995, providing education in both Judaic and secular studies. A yeshiva for advanced Jewish studies opened in January 1992. There is also Jewish school for teens. Since August 1993, Chabad has organised summer youth camps. Kids have been preparing for Bar and Bat Mitzvahs since February of that same year, and moreover, are encouraged to learn about their heritage. Men and women, too, are actively courted to participate in religious studies which aim to rekindle and enhance a long dormant Jewish way of life with import and relevance in a newly emerged Latvia. Since March 1992, the soup kitchen has provided some forty hot meals a day in a cozy atmosphere for those elderly members of the community who cannot survive on their pensions. The kitchen serves up an additional 300 meals a month for those who are homebound. 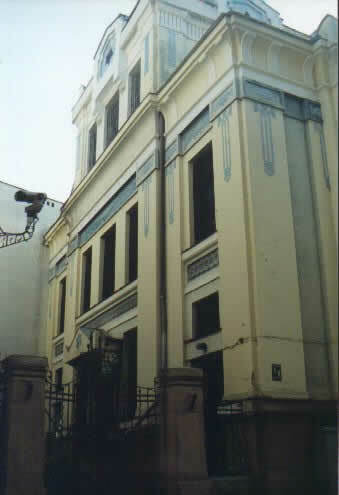 The Riga synagogue is only a shadow of its former self. Its two storeys stand behind a heavily chained gate giving the first time visitor the impression that it is firmly shut. Upon entry from a derelict back entrance, I found eleven seasoned men wrapped up in the leathery web of morning tafillin, davining rhythmically beneath grand chandeliers suspended above a bimah of brass and marble. In front, Rabbi Glazman's entire body rocked with prayer. I took a seat in the back next to a man who just glared at me. A late arrival approached me and said, "Jewish?" When I replied I was, he extended his hand in welcome and said "Shalom". Another man passed me a note on a tattered scrap of paper: "Let's go to the Riga [old ghetto]" it read. The ghetto is situated about one kilometre to the southeast of the old city in a three-quarter square-kilometre area known as Maskavas Forstate. Little remains of the area's once vibrant Jewish character save for a legion of derelict wood and brick buildings and a few memorials to the victims of the holocaust. Still, a walk through the area is rewarded with stops at such places as Die Greise Hor Shul, The Big Choral Synagogue, on Gogola Street, which was completely destroyed on 4 July 1941. On that morning, about 300 Lithuanian Jews took refuge from the Nazis in the basement of the synagogue. The doors were locked and the synagogue was set alight by Hitler's henchmen. Such was the fate of many other Jews and synagogues, a seemingly favourite means of Nazi execution. On 4 July 1988, a memorial was dedicated on the very spot. The Old Jewish Cemetery on Liksnas Street was the first tract of Jewish land in Riga; it was obtained in the early 18th century. The road leading to it was known as Hebraische Begrabnisstrasse, or Jewish Cemetery Street. The location became a killing ground in July of 1941. After the war, the cemetery was desecrated. Today, it's a park. Strewn all about today's Old Town are fragments of yesterday's Jewish past: Gmilas Hesed, a Jewish philanthropic society, on Stabu Street; a society for the promotion of education among Riga Jews on Abrenes Street; the first Jewish press in Riga on Peldu Street; the first secular school on Lacplesa Street; the central office of the Jewish National Fund on Daugavas Street; and a good deal more. Riga is an open book of Jewish history. Like Lia German and her exhibits at the Jewish Museum, messages from the past are strewn about the place. As she had said: a visit to Riga is know Jewish history here. Discovering the history of Riga's Jews is made more thorough with a visit first to the Jewish Museum, 6 Skolas Street, Old Town. There, pick up The Jews in Riga: a guide. This 31 page booklet comes complete with a map pinpointing all the places referred to in the guide. If you would like to make a financial contribution to the community, you may send a moneyorder payable to Chabad of Latvia, P. O. Box 96, Riga, LV-1047, LATVIA. Tel: (371) 733-4147. Fax: (371) 783-0444.